MetroParks has the only trails in the area built specifically for and open only to mountain biking, at the Huffman MetroPark's Mountain Biking Area (MoMBA). MoMBA provides more than 9 miles of trails for bikers at all levels, from beginner to the most advanced. New for 2016 are several improvements, including a beginner trail (Hilltop Flow Trail), a Tot Track and wash station. Hilltop provides a fun experience for all levels of mountain bikers. This flowing trail includes optional progressions to work on the skills needed to ride more difficult trails. Designed specifically for balance bikes, this trail provides beginning mountain bikers an opportunity to ride on a natural surface that rolls and flows just like traditional single-track trails. The Twisted trail is a quick, flowing ride that leads to Five Points Junction. From there, ride Voodoo, the flattest trail with wide open sight lines. Like the name implies, Mr. Zig Zag winds through the forest without losing or gaining much elevation. Upper Stealth is a rollercoaster ride while Lower Stealth has some tight technical turns with little elevation change. Creekside is the longest trail at MoMBA with a mix of long climbs and descents as it crosses the creek several times. Riding counterclockwise out of Wild West Junction, Hawk’s Lair begins with a climb before descending through tight technical turns. Lots of exposed rock and cobbles add to the challenge. The Talon offers some highly advanced features for the most skilled riders. Five Rivers MetroParks offers a system of skills features and mountain biking trails at Huffman MetroPark to provide riders with an easy start, a great ride, and a fast finish. Memorial Day through Labor Day, mountain bikes are available for rent on Saturdays from 10AM to 1 PM. You can try out the eight miles of single track without committing to buying gear. Bring the little ones out — youth bikes are available. Our programs build on one another (Discover then Develop then Do) – all striving to empower you to feel comfortable and confident in the activity. If you are new to the activity, begin by exploring the Discover programs and move on to build your skills. Those with fundamental skills can deepen their knowledge with Enhance programs. Programs listed are offered in rotation. Check the Program & Event Finder for specific dates and times. 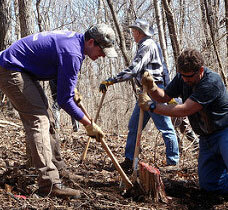 Help maintain the mountain biking trails at the MetroParks Mountain Biking Area (MoMBA). No experience necessary! Tools are provided. See program and events finder for upcoming dates or contact yvonne.dunphe@metroparks.org for details. For a complete list of local outdoor clubs, businesses, and equipment rentals go to OutdoorDayton.com.